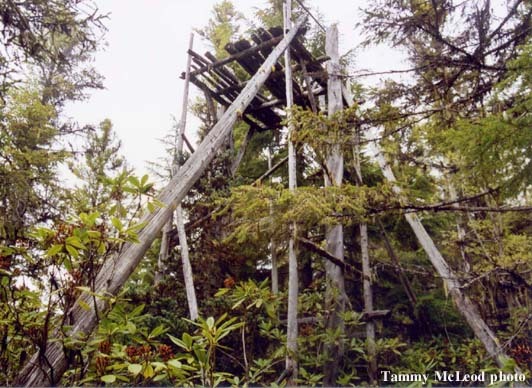 This page provides a photo archive of lookouts, shelters, and other structures found in the Olympics. This is a cool way to preserve and share these rustic yet fragile pieces of history. Submissions are welcome as we strive to create a complete photo archive of all the standing (or no longer standing) structures in the Olympics!! Devastating fires, such as the Yacolt Burn of 1902, inspired the construction of a vast nation-wide network of fire lookout stations in the 1920s. The job of the person who staffed a lookout was to spot and report fires by telephone or radio so crews could be dispatched quickly. At the system’s peak, there were 5,000 lookouts nationwide—including 685 overlooking the extensive forests of Washington. By the mid-1970s, most lookouts had been abandoned as fire-detection began to rely more on technology and aerial reconnaissance. Some were deconstructed by government agencies worried about liability, some have been left to rot, and some have been restored and are maintained by hikers. Washington now has 92 lookouts still standing in their original locations, with less than 30 of those still actively used for firefighting. Six of these lookouts are on the Olympic Peninsula: Kloshe Nanitch, North Point, Pyramid Mtn, Lone Mtn, Dodger Point, and Ned Hill. All six standing fire lookouts are in the photo archive on this page. Photos of some of the old fire lookouts that have been torn down are also shown. When it built trails years ago, the Forest Service constructed log-and-shake shelters at intervals of 8 to 10 miles, in both the low and high country, as housing for trail-maintenance crews. At first, the National Park Service (NPS) maintained the shelters. However, as use of the wilderness increased and the areas near the shelters began to show signs of overuse, the NPS decided to remove the shelters. Many backpackers objected, so the NPS decided instead to remove or relocate some shelters and retain others (primarily the ones in forested valleys) as emergency huts where hikers can hole up during severe storms. There are still several shelters found in the forested valleys of the Olympic Peninsula. Some of these shelters are in the photo archive on this page. It is our goal to eventually have a photo and description for each one. Photo by John Myers, June 2009. WHERE: Dodger Point, 17 miles SSW of Port Angeles, Clallam County, elev. 5753 ft.
OTHER INTERESTING INFO: L-4 cab. Photos courtesy the Dave Bula collection and the Fire Lookout Museum. WHERE: 7 miles W of Lake Crescent, Clallam County, elev. 3040 ft. DATE BUILT: 1917: cupola cabin. 1/2 mi SW of North Pt LO. 1995: new D-6 cupola cabin. OTHER INTERESTING INFO: The first lookout at Kloshe Nanitch on the Olympic National Forest was a D-6 wooden cupola groundhouse built in 1917. With the later addition of North Point Lookout, it was gradually phased out as a detection site. The original structure was destroyed in 1963. 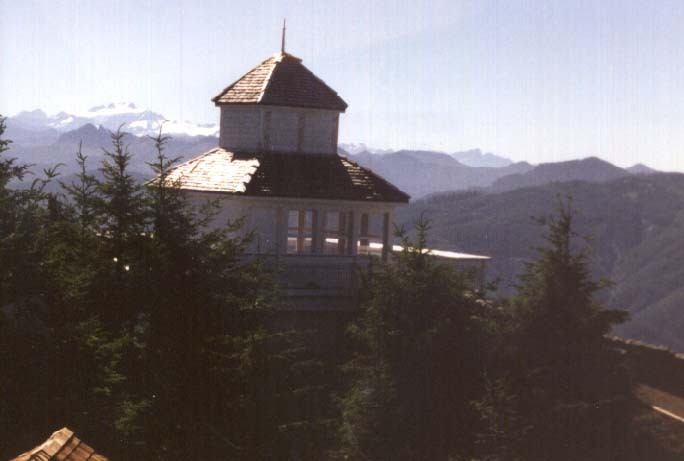 However, in 1996 the Forest Service rebuilt the historic cupola design, upgraded to current construction codes, as an interpretive site and recreation rental. The lookout is accessed by a good gravel road from the USFS Snider Work Camp. Due to improvements to the very short access path, it is wheelchair accessible. The lookout offers spectacular views of Mt. Olympus, Lake Crescent and the Sol Duc River. It is located at the transition zone between the lower western hemlock forest and the high elevation silver fir so it has a beautiful display of diverse wildflowers. The Backcountry Horsemen of Washington and the Forest Service are planning a hiking/horse trail to Kloshe Nanitch from the Littleton/Mt. Muller Horse Camp to the east. This will connect the lookout to the Olympic Discovery Trail, which crosses the Olympic Peninsula. They are actually opening up an old trail that became grown over. The lookout received funds from the Secure Home and Schools Act to help maintain it for the public's enjoyment. Listed in the National Historic Fire Lookout Register. Photo courtesy of Tammy McLeod. WHERE: 7 miles W of Lake Crescent, Clallam County, elev. 3340 ft.
OTHER INTERESTING INFO: This L-4 cab, built in 1939, was abandoned as a lookout in 1969. 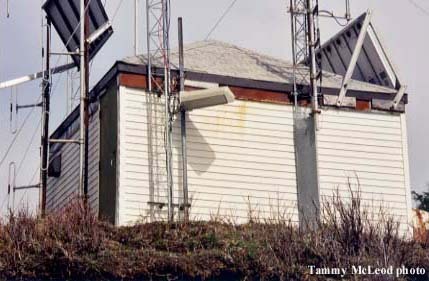 It has since been converted to a radio communication building. WHERE: 1/2 mile north of Lake Crescent, Clallam County, elev. 3000 ft.
OTHER INTERESTING INFO: Cabin style lookout, abandoned in 1945. Still there. WHERE: 3 miles west of Lake Quinault, Grays Harbor County, Quinault Indian Reservation, elev. 1173 ft.
OTHER INTERESTING INFO: This 90' steel tower, built in the 1940s, has been abandoned for many years. WHERE: 15 miles SE of Port Townsend, Clallam County, elev. 3450 ft.
OTHER INTERESTING INFO: This pole platform tower, built in 1933, has been abandoned for many years but is still there. Photo by Roger Beckett, July 1965. WHERE: Mt. Jupiter, 12 miles southwest of Quilcene, Jefferson County, elev. 5701 ft.
OTHER INTERESTING INFO: L-4 cab. Destroyed 1967. Photo by Steph Abegg, April 2007. Photo by John Myers, August 2000. Photo by John Myers, June 2002. OTHER INTERESTING INFO: The Enchanted Valley Chalet was built almost entirely from materials packed in for a summer resort in 1930. Today it is closed to the public with the exception of an emergency shelter at the rear of the building on the ground floor. The remaining area on the ground floor serves as a backcountry ranger station. A leisurely backpack trip is arguably the best way to enjoy this spectacular glacially-shaped valley and the chalet. The trail is 13 miles and gains only about 1,000 feet, with gentle ups and downs, and is usually open by March and can be hiked as late as December in a low-snow year. For a real treat, visit during peak snowmelt season in May or June when dozens of waterfalls spill down on both sides of the U-shaped valley.